Welcome to the best home treadmill review. Running machines have been around since the dark ages (ok maybe not but they have been around a long time) there just as popular in the gym as they are at home. There is a magnitude of running machines to choose from, some extremely expensive and some insanely cheap but what sets these apart and how can some warrant 6x more than others? With all home equipment, there is a danger of your exercise machine turning into a really expensive coat hanger, trust me I know of a few that have! Before investing in a treadmill you should ask yourself can I save myself money by opting to run outside instead, of course there are benefits to having a treadmill such as absorbing shock that’s associated with running so your joints won’t take a pounding and the weather can’t stop you from working out! If you want a powerful weight loss tool or generally want to get fit then the Life Fitness F1 Series Treadmill is a great choice it Will last you a very long time and saves space in your home. Keep reading for the pros and the CONS of this machine, my thoughts, what others think about it and where is the best place to buy it from. The F1 has taken your treadmill experience to the next level like all Life Fitness products they come stylish and durable and will comfortably suit your home or gym space. Life Fitness understands that running can be boring, monotonous and bad for your joints through weight bearing down on your joints this is where the F1 excels above its rivals. To make sure you’re you receive the best benefits life fitness have included a chest strap to monitor heart rate, currently the most commercially accurate way to monitor your heart only being beaten by medical grade ECG. Love music? The F1 is compatible with ipods, you can create a custom playlist to keep you motivated through the powerful unique custom-made workouts you have created. The innovation doest stop there as they have also increased the burden your joints take when running by designing “flexDeck” this patent technology reduces 30% more shock than running outside and will give you a much better user experience. Other extras are an accessory tray and reading rack to conveniently place your kindle on. When the machine is not in use you can simply fold it up for storage! As standard like most treadmills, it comes with your basic controls and programmes on the interface dashboard, with metrics such kph, calories and different programmes to name a few. I have seen and used many different treadmills in my time and pretty much had the mindset that a “treadmill is just a treadmill” they all have the same function…… you can run on them! As I get older I do have a nagging little voice that keeps telling me to protect my joints, especially my left knee as I am developing arthritis from an accident I had when i was in my teens, so a treadmill isn’t just a treadmill anymore I need something that’s going to protect me from further damage. That’s what I like about the F1 as fitness is a big part of my life and I would be horrified to be told I can’t do activities that will impact my joints. I love that life fitness has taken the time to get to know how running machines can be so boring and uninteresting by allowing you to upload your own custom workouts instead of plodding along to just the inbuilt ones that no one never uses. This particular machine sits at the higher end of the market coming in at £1995 ($2600) quite costly would you agree? That is why they had to give you something extra special for your money, personally, I would pay that just to protect myself from further joint damage. On top of all the features, they also provide a great warranty something that is welcomed, other companies don’t give no way near as good warranty even on their high-end machines. Lifetime warranty on the frame and LifeSprings, 3 years electrical, console parts, labour and mechanical, 10 years for the motor, in essence over the course of your lifetime you will save money as the cheaper models are notorious for breaking. If you’re serious about losing weight or improving your fitness then this has massive value just don’t go spending all that money just to throw clothes over. Is the F1 hard to assemble? No, it’s really easy to assemble but would advise the delivery men to put it in your desired room as not suggested to lift on own that’s if you can lift it. Does it have incline and decline function? There is an incline but no decline. Does it have the standard inbuilt programmes? The F1 isn’t all good as with everything there are few cons, however, they weren’t easy to find and don’t seem to be many at all! 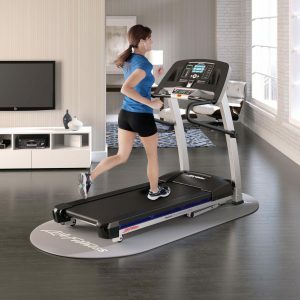 Hope you enjoyed best home treadmill review as much as I did writing it although it has a big price tag and a few niggles, Life Fitness have really got to grips with what customers want from home exercise equipment. I imagine some will be put off by the price, however, if you look at the bigger picture the warranty is fantastic and more than likely save you money in the long run not to mention saving your joints from potential long-term injuries. If you’re serious about a lifestyle change then invest in the best, if you buy cheap you will be twice and won’t get the best out of it. Great review on the Life Fitness F1 Treadmill. I was in the market a few years ago and bought a ‘lemon’! And yes the expensive ‘hanger’ is still sitting in my garage…it never worked properly right from the start. Had I found your site first I would probably be a lot fitter now than what I am. I loved the video you have presented & it sounds like the features are exactly what I need. As I advance ever closer to an age milestone I am not looking forward to, I reckon I will have to give F1 treadmill some serious thought if I am to keep up a healthy lifestyle! There’s only one question I have…is it easy to get replacement parts if required? I just encountered with your article. Just wanted to say what a great review, so many details. and this was a life changer for me. It has a lot of program that you can choose from, such as interval (great for burning fat as my coach told me) and you can also change the Incline to Simulate running on a hill and a lot of feature. I believe that anyone that wants to lose weight needs to have it along with a good diet program. Thank you for the very informative article about treadmills and what they can do generally and why you personally would chose this one: to protect your joints. I like the video which gives additional visual clues to entice me to really consider to purchase it – despite it is boring, as you say, to run and run and run. I cannot tell you how helpful this review has been for me. I am trying to figure out which treadmill is best for me (and my tiny home space)– and whether or not I should just keep paying for my gym membership. Right about now, I think I’m sold. Thats ok love to help, think about your options carefully as this is a big upfront cost and gym membership is smaller monthly instalments. Hey great review of this product. I have always been a fan of eliptical machines because they offer less impact on the joints then treadmills. How does this compare to an elliptical machine? Also do you have to wear the heart monitor under you shirt or can it go over? The treadmill and cross trainer are hard to comapre, but for joint cushioning the cross trainer would beat the treadmill all day long. Thanks for very clean and detailed article about F1 Treadmill. You mentioned one very important thing in your article regarding the burden of joints. The health comes first, and the injuries during training are very common especially if we use those kind of machines which does not have patent technology like F1. Do you have experience with it from the first hand, or do you know someone who already used it? I havnt used this particular treadmill but i am very familiar with life fitness and there all built with the same great engineering they just add a few gizmos on to this one. The added benefit of 30% shock reduction is a great function. My family and I have been thinking about getting a treadmill and i’ve pretty much fallen in love with this one already. Will be looking at making a purchase in the near future because it is a bit pricey but i believe it is worth the money. Hey, Great Review about F1 treadmill, this treadmill seems really great and could stay alive for a long time, what i liked about F1 treadmill that it’s designed with a quite motor function which is really good for people who wants to jog without making alot of noise at a quite home, and also I liked that it is designed for space saving tho, Most of the people can’t afford a treadmill cuz of lack of space, but this will help alot! Thanks for helping us with these useful information. Life Fitness always aim for quality equipment thats built to last, the quite motor is a great feature but wont stop the noise from the actual foot steps. I love this treadmill! I seriously need to get one as I really hate going to the gym all the time. Sometimes I would just like to be able to get in a workout at home. This looks like the one I need. The price is a little hefty, but then it looks durable and long lasting. I didn’t see anywhere about a warranty. Do you know what that would be for this machine? With all life fitness products they always offer a huge warranty I suppose they have to with the price they ask, also there products are very sturdy and ill be surprised if you need anything changing in the first few years, most of there products are “gym” designed so made for lots of use. Very nice to meet you.I really enjoyed the review on the treadmill. I am one of those people that is struggling with weight. Elevated cholestrol and thyroid issue. I have lost weight, gained, bought a total gym, went for walks, bought weights, dvds. my adult daughter is following in my foot seps. Any way I’m sorry for telling all that. You are doing great with your site. Congrat’s. Dont be sorry thats what this site is about, we all need help in life and thats the beauty of the internet theres is a place for everyone. You can do it you just have to start and find motivation why not do it with your daughter and become fit and healthy together. Wow! I can’t believe that there’s a USB on this thing so that you can customize your workout. I’m guessing that must include different speeds and inclines? Can you upload ones for HIIT? That would be so awesome. Also, the tunes are a must and I like that it won’t eat up my electricity!! Thanks for the great review. The F1 treadmill really does have some great features, I love the music aspect and you can create custom programmes I am not sure about High intensity workouts as its “classed” as unsafe on a treadmill and cant find any information on it. I’ve also always thought a ‘treadmill is a treadmill’, how many features can you put into a machine that just allows you to run on it? With the joint thing I feel like that has more to do with your shoes than the treadmill. Sure, the treadmill may reduce impact on your joints but I think you should maybe consider buying a new pair of shoes before spending hundreds of extra dollars on a treadmill to reduce joint pain. Hi Matt, trainers do help but there not the be all and end all as you still get a massive shock if you wear the same trainers and the reduce by another 30% that’s what you get with the Life Fitness F1 Treadmill. Certainly, agree with you that you should look at alternatives before spending any amount of money, however, some people are more comfortable exercising indoors. Great post. I am a runner and every time I am running I think about my joints. I am now glad to learn that this F1 treadmill can help reduce the impact my joints go through while running. Thank you for the info. It was one of the main reasons I liked it amongst the fact it can take a mundane workout and make interesting in the form of making your own workouts. Really great review of the treadmill! I’ve got an elliptical at home which works pretty well, but i’m a big fan of running. I’m actually going to be running a half marathon soon, so i’ll be having to start training on the treadmills at my gym. I would love to have my own treadmill, but that price tag definitely is a bit on the steep end for me right now. Maybe someday! Thanks for the great review! Nice review! The reason I don’t have a treadmill is because it would end up as one of those dreadful coat hangers that you spoke of. This one sounds like a good one for someone who is looking for a solid machine. I like the idea that it folds up also. Thank you for sharing! It is a solid machine and you do have to be committed to this price or will the price make you committed depending on how you look at it. Check at this post on TRX as there a fraction of the price and will provide you with a lot more than running alone. I do like the addition of the new features such as the custom workouts you can make. 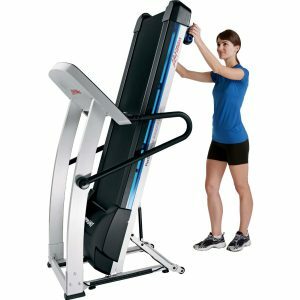 Are life fitness treadmills sturdy and a reputable company? The custom workouts are a great addition and life fitness are very reputable, in fact, most gym chains in the UK will have life fitness. Nice review, but do they really need things like this then we have Pokemon GO? What a great article! I’m starting to get up there in age… 🙂 but still have an interest in tread mills. I’m trying to decide between a treadmill vs. a climber or elliptical. This treadmill is pricey, I agree. However one needs to consider the quality and the life of the equipment. If you can get 5 years of life out of it, I think that would only equate to less than $1.50 a day. Great review! This sounds like a solid choice in a treadmill. As you say, pricey, but then, “You get what you pay for.” And the warranties sound excellent. Do you have any information on their customer service? I’m not running yet. Hurt my knee one year ago (tore my patella tendon, and I’m still recovering). 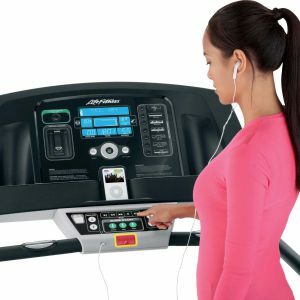 Would this treadmill be a good choice for someone who wants to start a walking program? Or would you recommend a different machine? It seems like the joint protection would be an added benefit for me with my knee recovery. And then, once I’m back to normal, THEN I could use it to run!